Daybreak at Island Beach State Park. IT’S 4:30 IN THE MORNING in Seaside Park, and I’m in the back of a van, questioning my priorities. During the summer season people come to this town to make bad decisions, like appearing on a reality show or calling themselves “The Situation.” When the temperature spikes in July, males of a certain mindset descend on the area to buy out the local repository of body spray and seek out the kind of girls who respond to the scent. But we’re in another season and the predawn crowd is looking for different opportunities. The van I’m in belongs to Bob Popovics and he’s headed to water. We drive past the site of Cap Colvin’s old shop, where Cap first taught Pop, as his crew calls him, how to cast a fly rod. We roll past the seasonal hotels and rentals and head to the undeveloped area of the beach. Pop turns off the asphalt and the deflated tires of his blue four-wheel drive Ford Econoline catch the sand in the cut leading through the dunes. The pin oaks and pitch pine trees give way to beach plumb and heather, then dune grass, and then the large spit of sand laced with tire tracks. Bob Popovics’ tricked-out beach van. 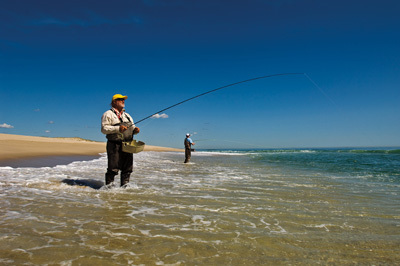 It is here on this sand in Island Beach State Park, and in the tidal shallows of Barnegat Bay, where saltwater fly fishing first gained a foothold in the Mid-Atlantic. 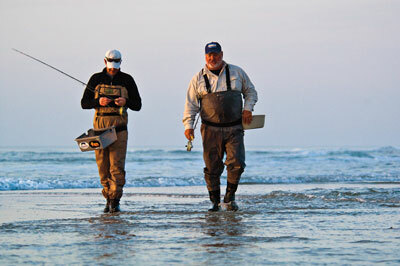 Cap and Fred Schrier started the Saltwater Fly Rodders of America in Seaside Park in 1964. They’d meet at Colvin’s shop and fish mostly in Barnegat Bay. Nobody used stripping baskets; they made loops with the line in their hands to keep it out of the sand and surf. They figured it out. 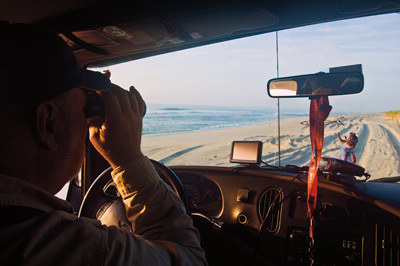 It’s mid-April, and Popovics guides his van along the deep tire grooves running the beach. We are following rumors of bluefish slashing bunker in the surf. Several trucks and SUVs are stacked up along the north end of the beach, and Popovics pulls alongside and rolls down his window. “They’re not like yesterday,” says one of his buddies, sipping coffee, his waders half on. One of the guys hooked up fifteen minutes ago. Yesterday Pop got into them so well that he sent me a text that started, “I hate to say this…,” knowing it would be the kiss of death. 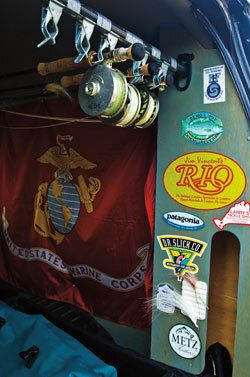 He opens the doors on the back of his van and pulls rods from a rack made of garage-wall tool clips and bungee cord. There’s a couch and a coffee table in the van, along with hangars for jackets and plastic bins for sandy boots and waders. It’s a tricked-out beach fishing machine. A United States Marine Corps flag hangs along the back wall. Popovics served in Vietnam and when he returned home in 1969, at age 21, he took to fly fishing. “Visually, I loved to watch the rhythm of it,” says Pop. He learned from Butch Colvin, Cap’s son, and Richie King, who took him under his wing, and the rest of the original Saltwater Fly Rodders. They used fiberglass rods with metal ferrules, and Pflueger Medalist 1498s. Pop glassing for birds and fish. Pop pulls a rod out of his rack and starts down the beach, walking toward the scent of a bluefish school that some people compare to the smell of cantaloupe. He bends down to point out a menhaden washed up in the surf. Its body has a crescent shaped bite mark where there used to be a caudal fin. He rises slowly, built like a linebacker but feeling his 61 years in his knees. He still works gracefully with the rhythm of the surf, moving forward as the water recedes and shooting line, then working backwards, stripping two-handed with his rod tucked beneath his arm. Popovics has done some of his most legendary work at the vise because of bluefish. “I’d get one fish and the flash is torn off and the hair is all ripped up,” he says. “I’ve been waiting all damn day for these fish to show up and I only get one shot before I have to change my fly.” He designed the Surf Candy, his groundbreaking epoxy fly, to withstand teeth. He’d already received acclaim at the vise for creating an 11-inch bunker fly in the 70s, and became known as a tier who thought outside the box. But his epoxy flies, originally made with bucktail and painted-on eyes and gills, brought Popovics to a new level. “For some reason it brought out creativity in me that I didn’t know was there,” he said. This is where you’ll find him when the fish are in. Pop loves the beach like no other. Popovics holds up a bunker fly he tied for the trip. In his hand it just looks like a bundle of hair. It doesn’t even have eyes. He runs it through a tidal pool and the fly comes to life. It pulsates and swims with a wide natural profile, the light reflecting as if off menhaden scales, and it looks like it’s breathing. The angler is Lance Erwin, a retired police officer from Seaside Park and one of Popovics’ oldest friends. The two have traveled the world together, but since the 70s their friendship has been forged on this sand. Lipping a bass in Barnegat Bay. Erwin’s the cop, but on the beach Popovics is the mayor. He knows everybody, the spin casters and fly anglers and anyone who spends time on the sand waiting for fish. For a while he was about the only fly angler left. 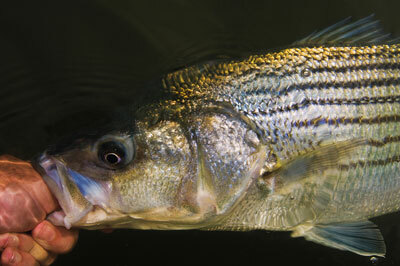 The Saltwater Fly Rodders, once the keepers of all international saltwater fly rod records, began to wane in the 1970s, coinciding with the demise of the striped bass. 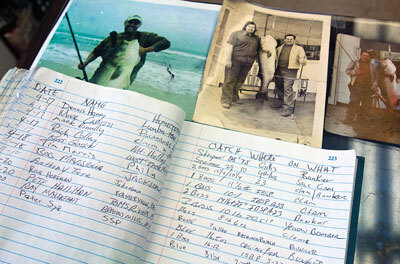 The club disbanded in 1977, eventually turning its records over to the IGFA, and leaving Popovics without a crew. The striped bass had all but disappeared and only a small scattering of fly anglers remained interested in working the beach. Popovics invited them over to his house. He and a few other guys started tying together and it became a regular gig. Every Tuesday night in the offseason, from January through May, people would show up at his front door. If you were in the crew you knew the door would be open; step into the living room, take the stairs to the left, duck your head to avoid the low ceiling, and head into Pop’s tying room. From 1985 to 1992, Erwin, Ed Jaworowski, Andy Renzetti and sometimes as many as 50 guys would show up. Out of these informal meetings Popovics and his friends formed the Atlantic Saltwater Fly Rodders, which has a few hundred members today. The stripers came back, and so did the anglers. A black pickup spins its wheels in the sand and stops next to Pop’s van. A man in black sweats jumps out and frantically pulls on his waders. The logbook at Betty & Nicks. “FONGOOL!” Sal jumps around behind his truck. “I was gonna go there!” Sal stomps around making hand gestures, the flaps of his waders twirling. They like to tell him the bite is somewhere else because it always sets him off. They call him Crazy Sal. The bite really is somewhere else. At slack tide we head back to Seaside Park and Popovics parks in front of Nick and Betty’s Tackle Shop. We walk through the front door, knocking sand off our boots and waders. By the cash register there is a logbook where anglers can record how and where they caught their prize fish for posterity. The fly tying materials are behind the counter; one of the local spots where Pop gets his supplies. The aisles filled with tackle open up through a foyer into pure genius: a diner-style breakfast counter. Every tackle shop in the country should have one (Cap’s used to have a counter, too). Still in our waders and boots, we take stools and order eggs and coffee and Bob thinks it over. Scarred and bitten bluefish from Barnegat Bay. Erwin runs us across Barnegat Bay to a flat we’re going to drift and as the wind pushes us closer to the shore, we see a large flash in the water. The bluefish are cruising in from deeper water. Popovics makes a long cast and works his fly back to the boat; the fly moves just under the surface and there’s a slash and a violent breach of water and a bluefish is hooked and not pleased. When the fight is over there are shimmering scales and blood spatters on the deck. Pop retrieves his silicon-protected fly and hands the rod to Erwin. 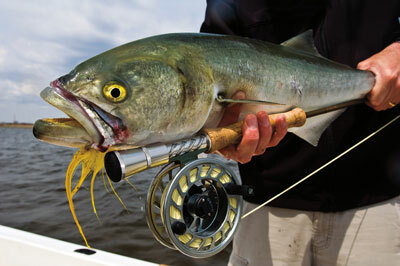 “One fish out of the surf on the fly is worth ten out of the boat,” he says. “The challenge is being on terra firma, overcoming disadvantages, accepting the restraints on you.” Popovics has open invitations to fish all over the world, but he is most at home on the Jersey sands, cruising in his Econoline, watching for signs, holding court with the locals, and waiting for the fish to move close enough for a cast. On the way out of town we stop for a moment in front of the beach house that MTV leases each summer. It’s the one with the map of New Jersey painted on the garage door in the colors of the Italian flag. We consider taking a photo of the house to include in this book, but we don’t.